Welcome to the hospital dentistry section! This section is for children and adults or those with special needs who may need general anesthesia to provide a safe and comfortable dental treatment. Hospital dentistry is a method of managing pain and anxiety during professional dental care through the use of general anesthesia. 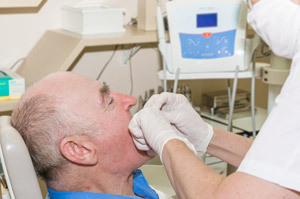 Dr. Gauthier has provided for over 35 years of restorative and basic surgical dental care while the patient is asleep under the care of an Anesthesiologist. General anesthesia is a form of deep sedation, and is used when nitrous-oxide sedation is not satisfactory and does not allow for the required treatment to be performed. This care is always provided in a hospital setting. A patient may need general anesthesia for dental work if a number of teeth absolutely need to be fixed or a child cannot cooperate for the appointment. Depending on the severity of the case and the cooperation of the patient, we may offer as an option a referral to another colleague for treatment. Caries (cavities) do not always have to be restored. If it is early and still affects only the enamel surface, it can be reversed with better oral hygiene (timely brushing) and topical fluoride treatments. Advanced caries through the enamel is irreversible and should be restored due to the possibility of dental pain, infection, or early tooth loss. Children who have caries that are irreversible must have their caries treated. The child that needs dental treatment, but cannot tolerate it in a dental office most likely will require general anesthesia to complete the necessary treatment. Children with special needs – autism, cerebral palsy, various syndromes, etc. The risks and benefits will be thoroughly discussed at the time of consultation. Treatment is painless, non traumatic setting. The client receives all the dental work at one time. Your child is allowed to stay positive about the dentist, which has been shown to promote a long-term positive attitude about dental care. Treatment is done with the highest quality in mind, allowing for long lasting restorations. Natural looking restorations require cooperation. General anesthesia allows for excellent esthetics and longevity.